Foreigners must not be able to buy UK homes with "plundered or laundered cash" as part a global effort to defeat corruption, David Cameron has said. Speaking in Singapore, the prime minister vowed to expose the use of "anonymous shell companies" to buy luxury UK properties - often in London. The PM said his message was "London is not a place to stash your dodgy cash". Corruption, he added, was "a cancer which is at the heart of so many of the world's problems" and must be tackled. Mr Cameron is on a four-day tour of South East Asia. On Monday, he announced the UK and Indonesia had agreed measures to counter the "shared enemy" of Islamic State (IS) extremism. Later in the trip he will travel to Malaysia and Vietnam. He has been accompanied by 31 British business leaders in an attempt to drum up trade with the UK and has also discussed the fight against terrorism with his counterparts. Describing corruption as "the enemy of progress", he called for a "global effort" to tackle it, saying the world has "looked the other way for too long". Citing the steps taken by the UK and Singapore to tackle corruption as part of enforcing a rules-based financial and legal system, Mr Cameron said a zero tolerance approach boosted trust and could improve business profitability and economic growth. A 2014 report by anti-poverty organisation One said an estimated $1tn (£600bn) a year was being taken out of poor countries because of corruption, warning of the use of phantom firms and money laundering. Image caption Mr Cameron said there should be no place for "dirty money"
And last week the National Crime Agency said foreign criminals were pushing up house prices in the UK by laundering billions of pounds through the purchase of expensive properties. In his speech, Mr Cameron said properties in the UK, particularly in London, "are being bought by people overseas through anonymous shell companies, some with plundered or laundered cash". Shell companies are non-trading companies that serve a particular purpose for their owners. More than 100,000 UK property titles are registered to overseas companies, with more than 36,000 properties in London owned by offshore firms. About £122bn of property in England and Wales is owned by offshore companies. The government is to publish Land Registry data later this year, setting out which foreign companies own land and property in England and Wales. It will also consider forcing a foreign company bidding for a government contract to "publicly state who really owns it". While the majority of foreign-owned business investing in Britain had "nothing to hide" and were welcome, the rules needed to be more transparent to counter those who were seeking to launder "their ill-gotten gains without being tracked down". "There is no place for dirty money in Britain," he said. "Indeed, there should no place for dirty money anywhere. London is not a place to stash your dodgy cash." Welcoming the pledge, Laura Taylor, head of advocacy at Christian Aid, said it was "another step forward in the battle for greater transparency worldwide". "Countering corruption is of fundamental importance in the fight against global poverty because of its impact on developing countries," she added. Diane Sheard, UK director of One, said: "Lifting this veil of secrecy will help developing countries to identify and recover these funds, which should be spent on essentials like health and education. "We hope that making information public about foreign companies that own property in the UK will deter money-launderers from doing business here." And Robert Palmer, head of the money-laundering campaign at the charity Global Witness, said: "London is a very attractive destination for very wealthy people, including corrupt officials who have looted their state coffers." He added: "What the Prime Minister has announced today is a really good step forward." 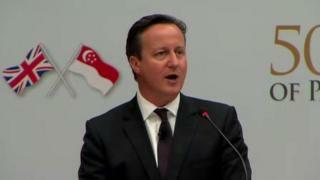 In his speech, Mr Cameron also pledged to boost the UK's trade links with Asean nations, pointing out that Britain had larger two-way trade with Belgium than with Singapore, Malaysia, Vietnam and Indonesia combined. The UK had become "too reliant" on its European market and must "not lose out" on the vast market that South East Asia represented - heralding a "partnership that can drive our shared prosperity for decades to come". Map: Which country pays the most bribes?